Definition at line 41 of file CQBrowserPaneDM.h. Definition at line 735 of file CQBrowserPaneDM.cpp. Definition at line 739 of file CQBrowserPaneDM.cpp. 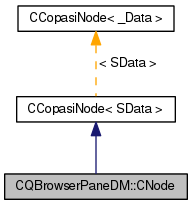 References CCopasiNode< _Data >::addChild(), and CCopasiNode< SData >::mData. Definition at line 755 of file CQBrowserPaneDM.cpp. Definition at line 768 of file CQBrowserPaneDM.cpp. 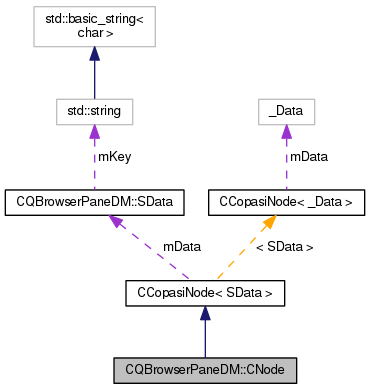 Referenced by CQBrowserPaneDM::data(), CQBrowserPaneDM::load(), and CQBrowserPaneDM::rename(). Definition at line 758 of file CQBrowserPaneDM.cpp. Referenced by CQBrowserPaneDM::data(), and CQBrowserPaneDM::getIdFromIndex(). Definition at line 788 of file CQBrowserPaneDM.cpp. Definition at line 793 of file CQBrowserPaneDM.cpp. References CCopasiNode< _Data >::getChild(), and CCopasiNode< _Data >::getSibling(). Referenced by CQBrowserPaneDM::index(), CQBrowserPaneDM::parent(), and CQBrowserPaneDM::remove(). Definition at line 773 of file CQBrowserPaneDM.cpp. Definition at line 763 of file CQBrowserPaneDM.cpp. Referenced by CQBrowserPaneDM::load(), and CQBrowserPaneDM::rename(). Definition at line 783 of file CQBrowserPaneDM.cpp.